For several weeks you too are in fall fashion. This frenzy of early season is autumn inspires us a breath of novelties, surprises and fantasies. An autumn coloring for girls gives the chance to make some adjustments to your mane affected by the sea and sun. 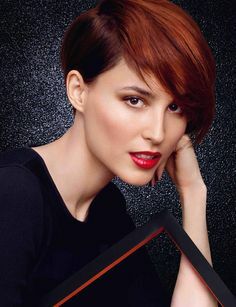 This is also the ideal time for this kind of hair change.For fall, there may be also crave a deep rich color. An autumn color for you girls, it is ideal for improving your confidence! This season, autumn brings its richer colors to multiple reflections of the most surprising and it is wrong to believe there is only the option. Do you do the makeover to bring some heat and madness in this mop. Warm up your color or change it. How? Here are some suggestions in order to get there. I’m blonde: a name we had forgotten « Strawberry Blonde » yes! Once my mother swore by his Strawberry blond. It is increasingly on the lips of the blonde. A richer and subtle color version strawberry blond pulling pastel. The strawberry blonde has just made ​​its debut on the podium of the colorations of school. Sometimes, however strange but sublime! Its name probably makes you think of a delicious milk drink of your childhood but it is the new trend for hair blonde. So named, this color is the alliance between a blond and subtle red highlights that take slightly pink. To put a little more spice to your most daring why not let yourself be seduced by the most dyed gray as steel and even the Opal Hair. I am black : you still have a choice. The warmer highlights await you as: the color mahogany (auburn) and Chestnut (Chestnut) will surprise you. Pass the true black will cause you headaches during your next turn unless you have an attraction togoth. For unconditional, there will always be the sombre and most discrete scanning. I have a other option with eggplant, Bordeaux. I am red: that ask for more! Enhance your color with tone on tone or gloss of the same level to keep your yourself. Less assaulting a usual coloring (20 volumes) gloss and tone on tone to work with an oxidizing May-October volumes. Here’s another thing, spice up your coloring with shampoo with pigment. The key is to give shine and depth to your hair. This color however is only suitable for light skin. I am light brown: the bronde and Broux await. You should have no difficulty in clarifying the points to get a high end dark. The honey blonde could be another choice, if your hair is not brown. The bronde, this color is perfect for those who wish to lighten their hair too without changing their natural base. I am dark brown: unquestionably hues Marsala, Bordeaux and eggplants are favorable. These shades are ideal for cold glare to counter the dull side of olive complexions. You will get a harmony between your skin tone and coloring. Readily available without fading, your hair will not do better. To advise on natural hair only. Posté le 29 septembre 2015 à 22 h 09 min.